In Exis, a heat is a generic term for the occurence of an Event. E.g. for the Men's 100m Event in Athletics, you may have several qualifying heats, 2 semi-finals and a final; whereas for Men's Golf there may only be one heat for the whole event, as even though there are multiple rounds of golf played, as these scores are combined to determine the overall result we think of it as one heat spanning mutiple days. On this page, we explain the different types of heat that can be created in the system, how they work and the particular sports and events they apply to. The first thing that needs to be done, is to create the heat itself. This is simply a case of selecting the relevant Sport and Event, and then entering the type of the heat, a name, and choosing whether or not it is a medal heat. The heat name is something that reflects the type of heat that is being created. Examples include Final, Group Stage, Bronze Medal Playoff, Round Robin. These get displayed on the results website and help to break up the results for an event. A medal heat means that in this heat, medals may be awarded, so if the heat is a Final, or a Bronze Medal Playoff then this box is ticked; this just controls whether or not users have the ability to enter medals when they enter results for this particular heat. The different heat types in the system are Individual, Group, Ladder, Knockout and Monrad. The system is setup so that it knows what types of heat are possible for each event, so if there is only one option for that event, you won't see this option. Please see below for more information on each of the heat types. Once the heat has been created, the next step is to enter a schedule information, and then to go on and enter the various competitors / teams into the heat itself - this is called Stage 1 of Heat Entry and it is the same for every type of heat. In Stage 1 of Heat Entry you will be presented with a list of competitors / teams that have been entered into the selected event during the registration process. All that needs to be done here is to select which of these competitors / teams are competing in this particular heat by ticking the box next to their name. On of the main advantages of Exis Admin is that when it comes time to setup the heats ready for result entry most of the hard work has already been done in the registration process as all of the competitors / teams are in the system already, so you therefore don't have any of the work of entering lots of competitors names nor correcting any of the many mistakes this can cause. To further speed things up there is a "Tick-All" button displayed so that all the boxes can be ticked in one go, as for many heats it is the case that everyone entered into that event will be competing in the heat. Individual heats are where the results of a competitor / team are not inter-dependant like they would be in a competition where competitors / teams compete against each other, like football or badminton. As a result of this, the heat entry is simply a case of selecting which competitors / teams are taking part in the heat. Optionally, there is a further stage where an Ordering / Lane Number can be entered for events where this is relevant, such as swimming. In a group heat the entrants to the heat are split into multiple groups which then have a series of matches, generally in a Round-Robin format. 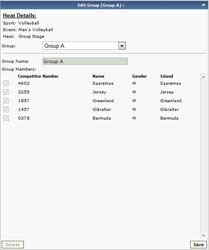 In Exis Admin, the process of creating the groups has been as easy as possible; users simply enter a name for the group and then tick which of the competitors / teams are a member of that group. As groups are created and competitors / teams added, the list narrows to list only those not currently in a group. 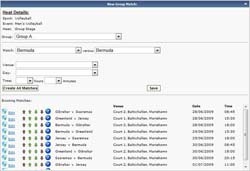 The option to "Automatically Create Group Matches" also allows users to automatically create a set of matches for that group with every competitor / team set to play each other. This is especially useful for events such as Men's Singles in Table Tennis where there are a lot of groups to setup. After creating the groups in Exis Admin, the final stage is to create the matches themselves along with any schedule information (optional). The matches within a group can easily be ordered and the order of the teams swapped round. Any schedule information entered appears on the results site in the full schedule detailing the individual match, as well as on the home page in the Upcoming Matches section. In Exis Admin a Ladder is an example of a Single-elimination tournament where competitors / teams play in a fixed ladder format where the loser of each match is eliminated from the tournament. To setup the ladder in Exis Admin the first round is created by pairing competitors / teams together in the order they appear in the ladder from top to bottom; to handle un-even numbers there is a "bye" option for competitors / teams who have received a bye in the first round. Once the first round matches have been created the "Create Ladder" button handles the rest and creates the subsequent rounds automatically. 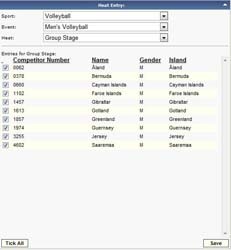 As results are entered into the system Exis Admin automatically handles the progression of competitors / teams through the tournament by creating the relevant match in the next round for the winner; it will even correct itself if the incorrect winner is entered. As an example of how a ladder looks in Exis Results please take a look at the Tennis Men's Singles for Rhodes 2007. A Knockout heat simply allows for a multiple matches to be created with a heat with a match description such as Final, Bronze Medal Playoff etc. This type of heat is used for the later stages of sports such as Volleyball, Football and Basketball where flexibility is needed. A Monrad heat, often referred to as the swiss system, is an alternative to a round-robin group where competitors / teams are seeded and given a number. Multiple rounds are then played with the winner of each match getting the lowest number; the idea being that when there are too many people to play a round-robin it allows for a fairer system than a ladder as competitors / teams end up playing against other competitors / teams at the same level. Squash is the only sport in Exis Admin that makes use of a Monrad. For an example of some results please look at the Men's Singles from Shetland 2005.